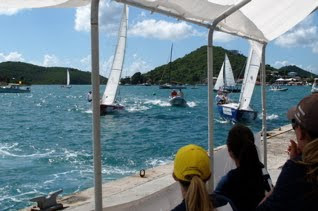 December 4, 2009 (Charlotte Amalie, St. Thomas, ISV) – The first flights of Round Robin 1 at the 2nd Annual Carlos Aguilar Match Race were sailed today. Many of the races started with both boats heading on starboard right into the seawall in front of the competitors. The team came out of match racing retirement and is performing like the Come Back Kids. They won all five flights that they sailed today. Their closest match was against defending champion, Taylor Canfield and his team, who were also undefeated going into the fifth and final flight in the Open Division. Jes Gram-Hansen and his sunburned Danish team also went undefeated today. Hansen is pleased with the team’s performance, but he said, “We’re on vacation and trying to spend as much time on the beach while we are here.” The Danes are not the only ones taking advantage of the spectacular weather by going windsurfing, snorkeling and swimming when they are not on the racecourse.